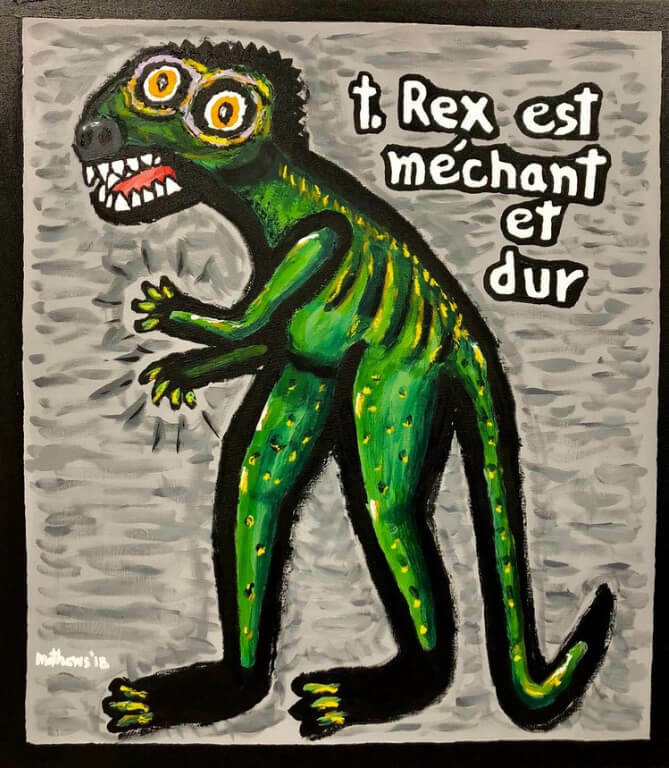 If we could talk to the animals, they might say “T-Rex est mechant et dur” (T-Rex is wicked and hard) as does the caption for the aforementioned dinosaur in In Come the Animals,a new solo exhibit by Bob Matthews at The Little Gallery opening Friday, Feb. 1. Mathews works with a colorful palate and a bright expression that’s a little bit fauve and a little bit Basquiat in this Benson First Friday exhibit. It all captures the personalities of their notable subjects – animals. The dogs, rhinos and, of course, dinosaurs in his work are front and center filling the canvas in increasingly thickened layers of acrylics and oils that details the animals in a way that is complex while feeling primitive. As a special collaboration, proceeds from sales will benefit the Nebraska Humane Society. In Come the Animalsopens Friday, February 1 with a reception from 6-9pm in conjunction with Benson First Friday and runs through the month of February at The Little Gallery, 5901 Maple Street.